What Type of Fertilizer to Use on Grape Vines? Where Can I Bury Scuppernong Grape Vines? If You Plant a Grape Stalk, What Will Grow From It? Most grape vines grow from 10 to 15 feet the first year; the Muscadine grows up to 20 feet. Grape vines don't produce fruit for harvesting until the second or third year. Cut string into a few 4- to 6-inch long sections. Push a bamboo stake into the ground behind the main trunk of the grape vine. Tie the grape vine to the stake, using two strings, one near the top, the other near the bottom. Select two main branches on either side of the grape vine near the bottom wire on the trellis. Use string to gently tie the branches to the wire. Move up to the next wire on the trellis and select two more main branches on either side of the grape vine. Tie these branches to the wire with string. Continue tying up the grape vine in this fashion, moving up the trellis, until you have worked your way up the entire length of the grape vine. Prune the vine. Immediately after planting, prune it back to just one stem with only two or three buds showing. Wait for new growth. Watch for new growth (shoots) to reach between six and ten inches. When that happens, select the strongest and fastest-growing shoot. Tie it to a training stake, such as a bamboo stake. Or, tie the tip of the shoot to the top wire of your post or vertical trellis. Prune off all other shoots. Pinch any new growth from the shoot back to the leaves on the shoot. Continue to do this during the first year of growth. Select two of the strongest shoots the second year and tie them around each horizontal wire. Allow them to grow along the wire. Remove the rest of the shoots. Prune off any competing shoots as the canes grow. During the second winter, prune the main two horizontal canes down to five buds on each cane. This will allow for better fruit. Prepare the soil by raking to a depth of 3 inches and then adding equal parts sand and topsoil to the existing dirt. The sand is to provide the drainage that grape vines like; the topsoil will provide nutrients the grape vines need. Rake again to a smooth, level surface and use the surplus mixture of dirt, topsoil and sand for elsewhere in the garden, or for containers. Dig holes 1 foot deep and 1 foot wide for each grape vine cutting or bareroot planting. Fill the rest of the hole with topsoil and pat down with your hands until firm. Water thoroughly and keep the ground moist, but not soggy. Overwatering is as bad as underwatering, as it may result in root rot. Fertilize every few months with organic fertilizer such as fish emulsion or steer mature. Water after each feeding; the only way the himrod grape vines can absorb the fertilizer, through their roots, is if it's been dissolved. Prune the grape vines at the end of each growing season. Remove old branches back to the trunk to open up the interior of the plant, allowing more sunlight in and increasing air circulation, which can minimize the risk of plant disease. Shape the rest of the plant as desired. 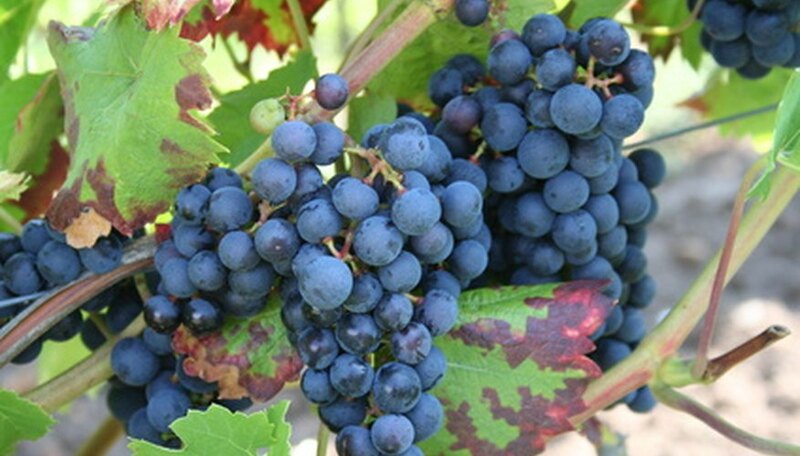 Chemical fertilizers with an N-P-K ratio of 10-10-10 are good for grape vines, according to the University of Missouri. Apply 1/4 cup of granular 10-10-10 plant food within one week of planting a vine and reapply within one month. Give your vine 1 cup the following year, before new growth begins in early spring. Do not give your grape vine too much fertilizer. 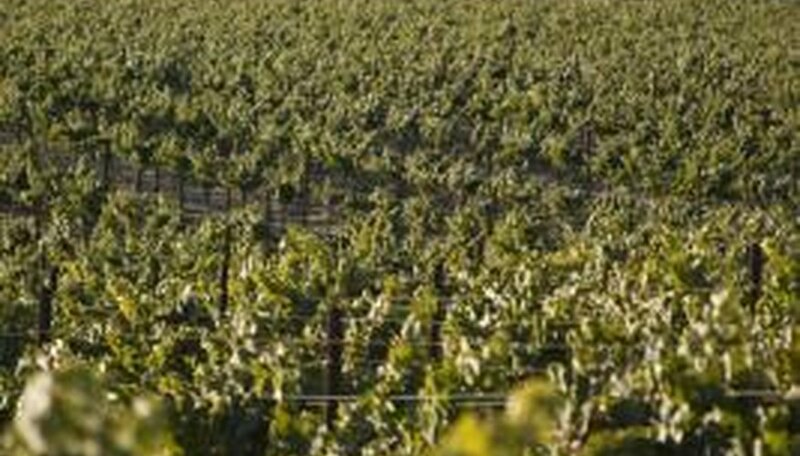 The University of California at Davis cautions against giving a grape vine excessive amounts of nitrogen. The University of California Cooperative Extension in Tulare County, a grape producing area, states that manure is a good fertilizer for grape vines. Different types of animal manure contain different percentages of key nutrients. An important consideration when using animal manure is to allow it to first compost well so no burning of the plant occurs. You can make your own comnpost from kitchen scraps and yard trimmings, or you can purchase it at a nursery. If you spread a 2- to 3-inch layer of organic compost around the base of you grape vine, it will provide continuous nutrition all season long. Reapply compost once each year, in spring. Look first for vines that grow upward and wrap around items such as trees. Grapevines do not grow along the ground (like ivy), nor do they grow outward so this is a crucial characteristic to look for before trying to identify the leaves. Search the vine for heart-shaped or three-lobed-shaped leaves that are a uniformly green color throughout the growing season, but once winter hits with the dormant season, start to turn purplish brown around the edges and curl upwards.. Grape leaves look like large maple leaves, sometimes growing up to 8 inches wide. Look for leaves that have a jagged edge, as all grape vine leaves have this appearance. They should not be smooth or round. Search on the underside of the leaves and the stems for the tiny fuzzy hairs that most grape vines and leaves have. Look for the small curly tendrils that grape vines grow near the base of the leaves. Mature grape vines have many of these, although the younger ones have enough to be noticeable. Examine the grape vine to determine if the length of each vine shoot is greater than 3 feet long. Vines that are less than 3 feet long should not be pruned. Determine which shoots you will cut off by looking for small buds along each vine. The purpose of pruning off vines in summer is to promote fruit production while managing the growth of the vine. Do not cut off vines that have many buds, as these will soon produce grape clusters. Hold the end of one vine in your hand and trace it backward until you reach the main trunk of the grape vine, or the location where the vine veers off from another branch. Cut off the vine using sharp pruning shears no less than 3 feet from the base of the vine. Be careful not to cut into the main trunk of the grape vine or other branches as this can introduce diseases to the vine. Continue pruning in this manner until all of the desired vines are removed. It's a good idea not to remove more than 30 percent of the grape vines during summer. Fill a gallon-sized plastic or wooden pot with a good, silt loam potting soil. Make sure the pot has drainage holes in the bottom. Plant a grape vine seedling, bare root plant or cutting in the pot. Place the container outdoors in full sun. Water the grape vines deeply, keeping the soil moist through the growing season. Do not let the potting soil get soggy. Fertilize with fish emulsion two to three times during the growing season. Beginning after growth starts, use this fertilizer, following the directions on the package for application instructions. Do not fertilize after mid-summer. Place a stake in the pot and secure the vine to it as it begins to grow. When fruit comes thin the fruit clusters, leaving only one or two clusters on the vine. Any more than this will weigh down the young vine. As the vine grows older and stronger you can allow more clusters to grow. Prune the vine in winter when the plant is dormant. Find the season's new growth and cut it back so it only has one or two buds on it. Cut right outside the bud. Collect seeds from vine ripened grapes in the fall for spring planting or obtain stratified seeds from a nursery or grower. Remove the seeds from the grape. Drop the seeds into a glass of water. Remove seeds that float; these are dead and will not sprout. Clean and dry the seeds and store in the freezer at 0 degrees F. Transfer the seeds to the refrigerator in December or January. Place the seeds on a paper towel moistened with a diluted fungicide solution to prevent mold and refrigerate until planting time in the spring. Plant the seeds in March or April, three months after removing from the freezer. Plant in small pots of potting mix and place in a greenhouse until all danger of frost has passed. Keep the soil moist until the plants germinate. Move the pots to a cold frame after the last frost date. Plant the vines in the garden in the early summer when the ground has warmed. Plant in sandy loam soil with good drainage. Water the vines during dry weather. Water deeply, soaking the ground once a week as needed. Dilute household bleach with water (one part bleach for every nine parts water). Submerse tools in solution for a minute or two to sanitize them and then rinse. Dry thoroughly with rag. Prune away the last season's growth in winter, when the leaves have dried and fallen and plants are dormant. Prune canes extending from established lateral shoots, or cordons, back to spurs. Each spur should have three to four buds on it. Remove all little flower clusters in the spring of the second growing season so that the plant's energy can be focused on growing the vine. Prune the canes grown from the previous year's buds back to spurs, each with three buds, in the winter after the second growing season. Prune the vines again after the third season of growth. Remove suckers from the trunk that extends below the trellis. Cut all visible grape vines so that they are 4 to 5 feet long so that you can easily see which vines have been cut and which are left. Cut the vines again as close to the ground as possible. Spread an herbicide around the area that the grape vines are growing in to help disintegrate the roots underground. Use an herbicide such as RoundUp, Weedone or Tordon according to the instructions supplied with the product. Apply herbicide in early March or mid-September, so that the vines are not bleeding sap, ensuring the herbicide takes hold. Place a canopy over the treated area of grape vines to keep the grape vines from getting any sunlight. Grape vines require sunlight to grow and survive, and shading an area will prevent new seedlings from growing. Decrease the amount of water you provide your grape plants by 50 to 75 percent of the amount you irrigated them before harvest. 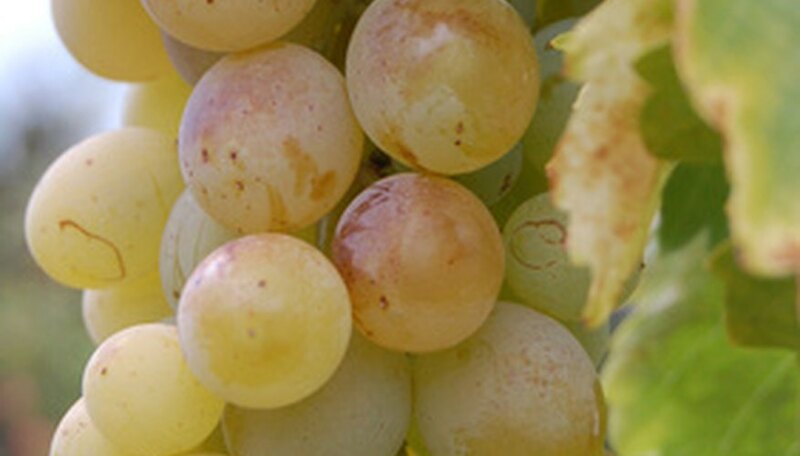 Consult with an expert to determine the exact amount to decrease watering, which depends on the variety of grape grown. Continue to water at this reduced amount from just after harvest until the first frost. Stop watering for four weeks following the first freeze of the winter. Untie the grape vines from the trellis and bend them flat to the ground. Cover the grape vines with 1 to 2 feet of dirt, straw or mulch depending on the harshness of your local winter season. Use more covering for colder, longer freezes. Wait until after the last frost before uncovering your grape plants for the new growing season. Sea grape gets the name from the fruit it bears that resembles a thicket of grapes when mature. Some birds forage for this fruit. The sea grape will flower with tiny white blooms on spikes that are 6 to 10 inches tall. The white flowers are a soft contrast to the leather feel of the tree. The female plant will fruit. The red fruits hang like grapes and is fleshy, with a stone center. The fruits are edible; a jelly can be made from them. Sea grape grows in full sun or partial shade. While it is drought tolerant, it does need water to get established. The plant is hardy in USDA zones 10 to 11, and tolerates salty water and soils. The sea grape is boiled in the West Indies to produce a red dye. Larger pieces can made into cabinetry. The plant can be made into folklore remedies, such as a gum made from the bark for throat conditions, and dysentery cures made from the roots. The sea grape is native to coastlines around the Florida Keys, West Indies, and Argentina. It is a tropical plant that needs coastal scrub and will not become treelike unless in the southernmost zone. Wait until fruit production has ended for the growing season and remove the grapes and any remaining leaves. Locate healthy second- or third-year canes from which to take cuttings. Use pruning shears to cut grape vine cuttings from established vines only as thick as a pencil. Make certain the cuttings have at least three buds at the top middle and bottom of the cuttings. 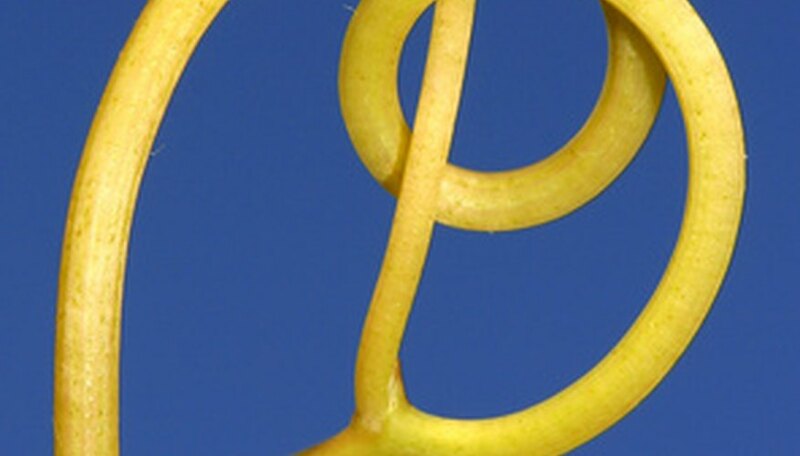 Cut the top of the grape vine at an angle and the basal end (the bottom) of the vine straight across. Dig a trench at least 6 inches deep in soil with good drainage. Set the grape cuttings standing up, with the basal end down, directly in the trench. Space the cuttings at least 6 inches apart. Fill the trench with soil so the middle bud is covered by the soil and the top bud is just above the soil line. Tamp the soil around the grape cuttings into place to remove any air pockets. Water the newly planted cuttings so the soil is moist but not saturated. Cover the exposed grape cuttings with mulch, if desired, to protect them from cold temperatures and frost damage. Uncover the grape cuttings in early spring after any damage from frost has passed. Transplant the grape vines into their permanent location while the vines are still dormant to ensure healthy growth for the season. Scuppernong grape vines prefer good draining, sandy soil with lots of organic material. Bury scuppernong grape vines in an area protected from frost and wind damage. 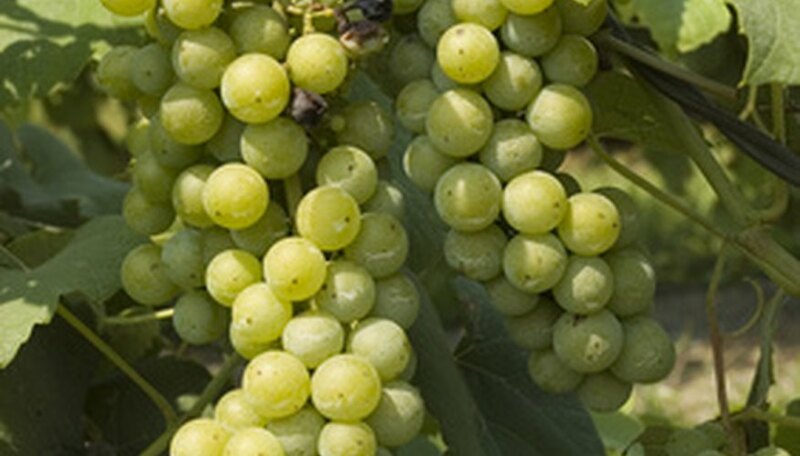 The scuppernong grape is the oldest muscadine cultivar native to North America. Plant the grape tree in full sun with well-draining, loamy soil on a southern slope. Hammer the T-posts about 1 foot into the ground. Space the posts every 10 feet for multiple grape plants, than lay the mesh wire across the front of the posts. Secure the mesh to the posts with wire ties. Dig a hole 10 to 12 inches deep and 12 inches in diameter at one end of the wire mesh fence. Set the grape vine carefully into the hole, and backfill the hole with soil, stamping it down. Soak the ground in water around the base of the grape vine, keeping it consistently saturated for about 15 days. Decrease watering the plants to once per week. Cuttings from dormant grape vines are used to reproduce the plant. The grape stalk takes root and produces a new vine genetically identical to the original plant. This is the most common method of propagating grape vines. Find the strongest and largest grape vine stem. Next, locate the two strongest stems on either side of the largest one. Use the pruning shears (make sure they are very sharp), and cut all of the surrounding smaller stems back to the base of this larger stem, and the two second largest stems on either side of it. Insert a wooden stake or vine stake next to the largest stem, in order to make the stem be the trunk of the grape vine. If there is already a stake there, position it so it is supporting the trunk of the vine and is sturdy. Pinch the top of the main trunk to encourage side branching if you want more vines to branch out from the trunk. The grape vine should resemble a main trunk with two side sets of branches. Continue to prune the side branches, but always make sure there are around 12 buds on the arms during winter, which are crucial to spring fruit production. Each of the 12 should have 1 to 2 leaf joints so the vine looks like a stubby hat rack when you are finished pruning. Place your grape seeds in a baggie, seal it and store the baggie in the refrigerator for 3 to 4 months. Set your seeds on a towel in your home where they will receive direct sunlight for at least an hour a day. Invert a glass jar or other container over the seeds and allow the sun to strike the glass. This will cause the temperature inside the glass to warm up to approximately 90 degrees. Leave the seeds under the jar for 2 days, allowing the sun to warm them for approximately 1/2 to 1-hour each day for 2 days. Soak your seeds in a mixture of 50% hydrogen peroxide and 50% water for 2 days. Plant your seeds in a mixture of 1 part sand, 1 part peat moss and 1 part perlite. Plant your seeds approximately 1/2 inch deep and water until the soil is damp but not soggy. Cut a 2-liter soda bottle lengthwise and place it over your grape seeds as a simple greenhouse. Place your greenhouse 12 inches under a grow light and give your seeds 12 hours of light and 12 hours of dark each day. Keep the greenhouse in a warm area. Be patient. Some grape seeds can take as long a 6 weeks to germinate. Do not plant your grape seedlings outside until all danger of frost has passed. Grapes like sandy, well-drained soil.